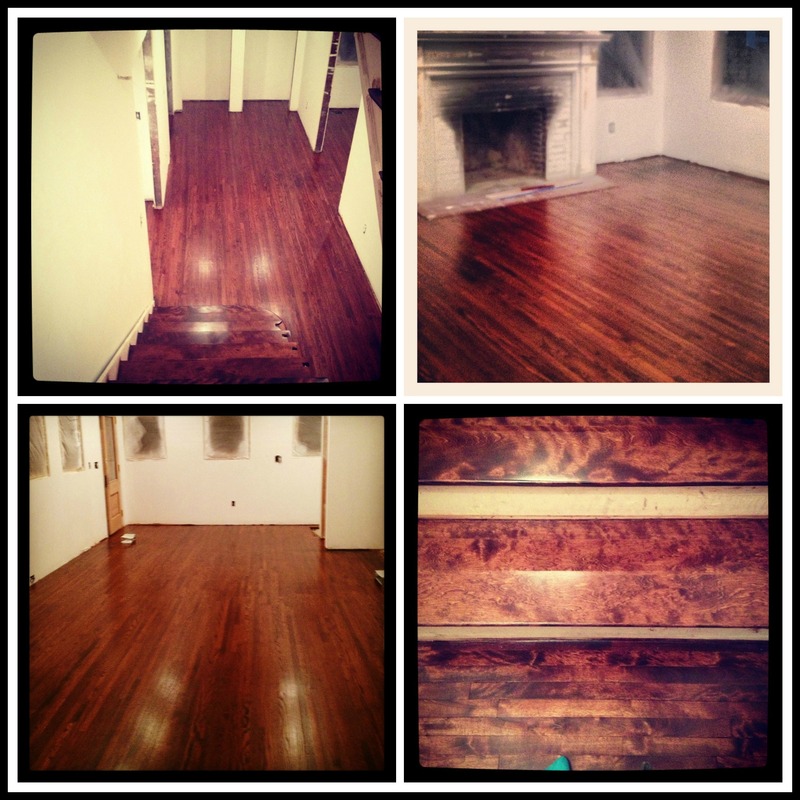 We’ve hit a major milestone: The hardwood floors are finished. And OMG are they gorgeous. I stopped by Matilda last night just to quickly check on things. Once I walked through the door, I didn’t want to leave. Despite the polyurethane high I was getting just from being in the house, I would have been happy to sit for hours in the living room and absorb the beauty. I was so overcome with how much Matilda is finally starting to look like a house rather than a construction site. I can really see our lives unfolding here. It made me so very happy. My favorite part are the stairs. That’s a huge leap from when we bought the house and I thought, “Well, they aren’t great but we can live with them. They are original.” They were painted pink and brown and the spindles were falling out. They were sort of a tragedy, honestly. But look at them now! 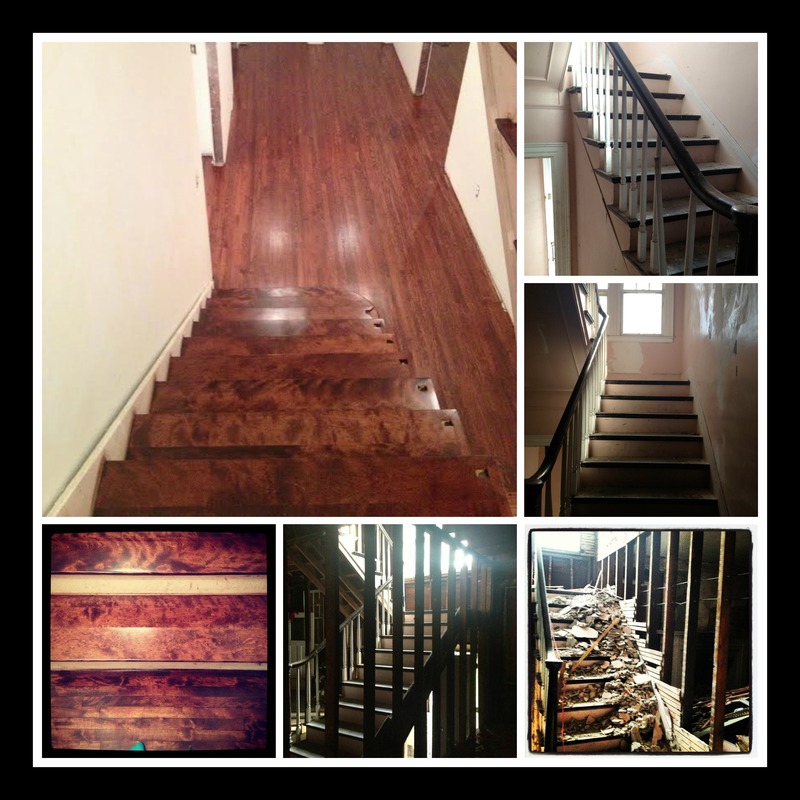 Our contractors took off the banister and sanded down all the treads only to discover original maple hardwood under all the paint. It took the stain like a dream, giving us this amazing “burled” look. Wow. Originally I had serious reservations about the stain color we selected, but our floor guy pushed me toward this color. We wanted the floors to look original, like they did when we bought Matilda, because they were one of the few architectural details that remained. We wanted to preserve that patina and I wasn’t sure this stain was going to achieve that goal. Damn if our contractor wasn’t right. No, the floors don’t look rough and beat up, but they do look like the original floors after a trip to the spa for a cut, color and massage. Still you, but a better version of you. So here’s my first lesson of home renovation without an architect/interior designer: Find contractors you trust and then let them do their job. They know their stuff. Our contractors — and all the subs on the project — have been amazing. They’ve hustled and delivered beautiful quality. I couldn’t be happier. I ❤ small business owners. I so agree. In our limited experience with a house of a similar vintage (younger sister, circa 1922) I’ve found doing solid research and hard consideration is worth it in gaining the benefit of greater experience. With our two houses, the emotional turning point in the refurbishing has been sanding the floors. That’s when the house has seemed to really take on a new life.